Team Ballydoyle registered their first winner at the 2018 Qatar Goodwood Festival following Land Force's victory in the £200,000 G2 Qatar Richmond Stakes under Ryan Moore. The well-backed 5/2 favourite, trained by Aidan O'Brien, ran on strongly close home to score by a length. Land Force finished third in the G2 Norfolk Stakes at Royal Ascot, with subsequent G2 Qatar Vintage Stakes winner Rumble Inthejungle in fourth. O'Brien's charge was a convincing winner of a Listed event at Tipperary before today's contest and a step up to G1 company could be on the cards for the colt. Kevin Buckley, Coolmore's UK representative, said: "I'm absolutely over the moon. Land Force battled hard. "Ryan was delighted with the performance. He got him into a nice position and he ran on well. "The Prix Morny or the Phoenix Stakes could be under consideration, but we'll wait till he is home before making any decision and Aidan speaks to the owners." Marie's Diamond, who was unsold at the Goffs UK Goodwood Sale, came home in second, beaten a length. 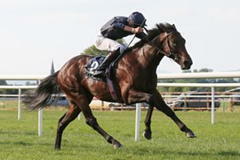 Mark Johnston, trainer of Marie's Diamond, commented: "He got squeezed coming out of the stalls and knocked a fetlock. "We said seven furlongs next but, Silvestre said no, a galloping track and six so it will probably be the Prix Morny (Deauville, Aug 19). "For me I am pleased that the horse wasn't sold yesterday, I don't know if the new owner would have kept the horse with me or not. I spoke to one man yesterday who said 'he has run an awful lot'. So has the winner of this race - they are the only two who have run an awful lot! "It does them no harm. His last three runs were very consistent. "Clearly, anything you send to the Prix Morny in August, if all goes well, will go for the 1000 Guineas in May (next year). It is all a bit pie in the sky at the moment, but you have got to aim for that!" Middleham Park Racing director of racing, Tim Palin, commented: "The syndicate voted to keep the horse. The owners voted not to sell at £650,000, - it was fascinating. "He was rated 98 and is now rated 108. He is in the Champagne Stakes (at Doncaster in September), but the Morny is the race that screams at you." Silvestre de Sousa, jockey of the second, added: "I was happy with the run. But coming out of the gates I was squeezed out and I lost a length - it was hard to make it up."